New York (CNNMoney.com) - Senate Democrats are once again trying to push through a bill that would send $27 billion to needy states. The measure contains $16 billion in additional Medicaid money and $10 billion in education funding to prevent teacher layoffs. State officials have been desperately lobbying their representatives, saying they need the money to shore up their budgets. President Obama weighed in Monday, asking lawmakers to pass the bill. 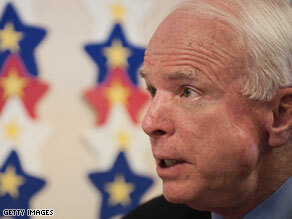 Lawmakers will take a procedural vote on Wednesday. It needs 60 votes to pass, meaning some Republicans would have to cross the aisle. If it passes this hurdle, a final vote could come late in the week, just before the Senate is scheduled to recess for the long August break. Senate Majority Leader Harry Reid, D-Nev., had pushed back the vote by two days to amend the legislation after learning it would increase the deficit by $4.9 billion despite offset measures. The amended bill has no impact on the deficit. Rep. Michele Bachmann, R-Minnesota, has opened a leadership PAC. 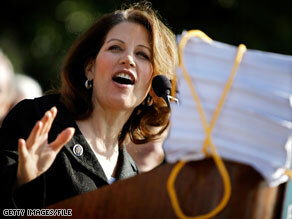 Washington (CNN) – Rep. Michele Bachmann is opening up her own national political action committee. Paperwork for the new PAC, called MICHELEPAC, was filed Friday with the Federal Election Commission. The committee will allow the Minnesota Republican to raise funds for distribution to candidates nationwide. MICHELEPAC, which stands for Many Individual Conservatives Helping Elect Leaders Everywhere, has yet to report raising any money. National PACs are not uncommon among House members and MICHELEPAC will be an asset for Bachmann, who is among the most effective fundraisers in the House. According to FEC statements, Bachmann has brought in $4.56 million this election cycle. A website for the PAC, listed on FEC forms, is not yet active. Jurors are done deliberating for the day in the trial of Rob Blagojevich. Chicago, Illinois (CNN) - A third day of deliberations ended Monday with no decision in the federal corruption trial of former Illinois Gov. Rod Blagojevich. 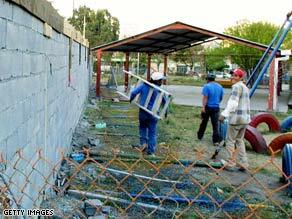 Jurors will return Tuesday morning to continue their work. Testimony wrapped up last week and deliberations began Wednesday. 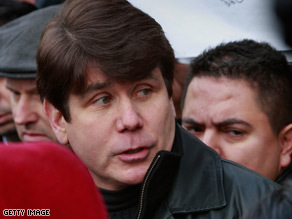 Blagojevich said that after listening to his attorneys' advice, he decided not to take the stand in his own defense. 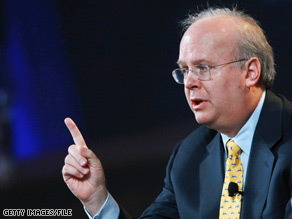 Lunch with Karl Rove is one prize being raffled by Gov. Rick Perry's campaign. Washington (CNN) -Texas Gov. Rick Perry is using social media sites, like Facebook, to round up support at the polls via a raffle that includes lunch with Karl Rove, former senior advisor to President George W. Bush. The Perry campaign launched the raffle as part of a recruiting effort to register more voters likely to show their support for the Texas Governor at the polls during early voting, said Texans for Rick Perry press secretary Alejandro Garcia. The effort is centered around a program called "Perry Home Headquarters" that allows Perry supporters to reach out to other like minded voters through social media. The groups then take their online interaction to the street, gathering in small groups across the state of Texas. The first meetings took place last weekend in Austin, Midland, Galveston, Dallas, San Antonio, Arlington, Lubbock, Amarillo and El Paso. And what's the incentive for voters to gather? Great prizes, of course. Prizes up for grabs are prizes include having lunch with Rove, according to the Perry website. Washington (CNN) – The Commonwealth of Virginia will be allowed to continue its constitutional challenge to the health care bill signed into law by President Obama earlier this year, a federal trial court ruled Monday. Judge Henry Hudson ruled in a 32-page opinion that the legal challenge mounted by Virginia State Attorney General Ken Cuccinelli should be allowed to continue. The state argues that part of the health care bill – Section 1501, which requires individuals to obtain a minimum level of health insurance – is unconstitutional. "While this case raises a host of complex constitutional issues, all seem to distill to the single question of whether or not Congress has the power to regulate - and tax - a citizen's decision not to participate in interstate commerce," Hudson wrote in his opinion. "Neither the U.S. Supreme Court nor any circuit court of appeals has squarely addressed this issue." Cuccinelli voiced his approval of the judge's ruling in a statement issued after the court ruled. "We are pleased that Judge Hudson agreed that Virginia has the standing to move forward with our suit and that our complaint alleged a valid claim." Cuccinelli said. 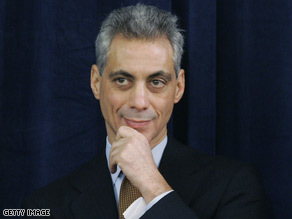 Rahm Enanuel will host a fundraiser for Rep. Kendrick Meek. Washington (CNN) - Rep. Kendrick Meek is getting some help from the White House as he bids for the Democratic Senate nomination in Florida. White House Chief of Staff Rahm Emanuel hosts a fundraiser for the four-term congressman Monday night at a private residence in Washington. Meek faces off in Florida's August 24 primary against billionaire real estate investor Jeff Greene, who announced his bid for the Senate just over three months ago. A Quinnipiac University poll released last week indicates that Meek trails Greene by ten points, with 35 percent of likely Democratic primary voters undecided. A Democratic source says the fundraiser with Emanuel was scheduled before recent reports that some African-American lawmakers were urging the White House to get more involved in helping Meek's campaign. The White House says the fundraiser is a sign of President Obama's support. "This event illustrates that the President remains firmly behind Congressman Meek's bid to be the next US Senator from Florida," White House Deputy Press Secretary Josh Earnest tells CNN. Rep. Alcee Hastings of Florida, a member of Congressional Black Caucus, says the amount of help Obama gives Meek could influence Obama's own prospects in a probable 2012 re-election bid. RNC chairman Michael Steele opened up to a Republican donor who turned out to be a conservative journalist. 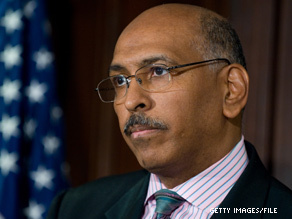 Washington (CNN) - Despite his trademark bluster, Michael Steele hasn't exactly been committal when facing questions about a possible second term as Republican National Committee chairman. "It's in the hands of the members," he shrugged to reporters at the RNC's winter meeting in Hawaii. But in an unorthodox interview with a conservative journalist posted online Monday, Steele proclaimed that a second term is all but certain - and he brushed aside news of a potential challenge from former Minnesota Sen. Norm Coleman. "Norm is an old friend. Norm is not going to challenge me for RNC chairman," Steele declared in phone interview with journalist Evan Gahr, who called Steele at his home posing as a GOP donor. "If he does I'll put my record up against anyone who comes after to me. I feel confident we'll get re-elected. I'm not worried about that part of it." An RNC spokesman verified the authenticity of the July 26 phone call, which Gahr transcribed on his website under the headline, "Punking Michael Steele." Steele, unaware that he was speaking to a reporter, boasted that his win and loss record "is better than any chairman in the last 10 years," a dubious claim considering that the vast majority of 2010 races have yet to be decided. Cafferty: Will ethics issues haunt the Democrats come Nov.? Remember when Nancy Pelosi promised to "drain the swamp" after the Democrats took control of the House a few years back? Well turns out some of her high-profile Democratic colleagues may be swimming in that very swamp. Two senior Democrats in the House of Representatives now face possible ethics trials – which is just about the last thing Democrats need headed into what's already shaping up to be a brutal midterm election. Long-time New York Congressman Charlie Rangel has been formally charged with 13 counts of violating House ethics rules... including not paying taxes on rental income from the Dominican Republic. Several House Democrats have already called on Rangel, a 20-term veteran, to resign.... and President Obama says he hopes Rangel can "end his career with dignity." Then there's California Congresswoman Maxine Waters. Today, the ethics panel charged her with breaking House rules by using her position to get federal bailout money for a bank with ties to her husband.